Living in a busy, touristy African city can be a bit overwhelming and challenging, especially for someone like me who thrives on peace and quiet in the outdoors. Arusha, known as the “gateway to the northern safari circuit," is a moderately sized city with everything you ever wanted. But with that “luxury” comes the trade-off of traffic, pollution, tourist traps, and the lack of nature. In a chaotic city with no sidewalks and a very limited supply of hiking trails, I was itching to find a way to get outside away from the hustle and bustle. I decided to venture into Moshi, a much smaller town that is located approximately 1.5 hours away from Arusha. Moshi is the “gateway to Kilimanjaro” and as a result has many different trails along the foothills of the rooftop of Africa. One of my friends recommended I stay at a lovely homestay, Shirikisha, which means “sharing” in Swahili. This amazing home is run by a beautiful lady named Cocaya, who employs an amazing staff to take care of the home, her massive garden, and her guests. Cocaya is literally the best cook I have met in Africa. From her homemade rosemary bread, fresh veggie samosas, and pineapple mint juice to her ginger teas, elaborate lunches, and vegan chocolate cupcakes, I literally could not stop eating. All of her food is fresh, homemade, and directly from her garden. I would wake up so full from dinner the night before but yet have no shame looking forward to eating breakfast as soon as I got out of bed in the morning (I really am a fat kid at heart). Cocaya also runs a small workshop, where she employees two young wonderful gals, Anna and Elisa, who are deaf. Cocaya has been working with the deaf community for over 10 years, and I was lucky enough to sit with these skilled artists and design many beautiful African creations (talk about women empowerment). Although I have zero artistic abilities, I have always have an eye for creativity and art. I know zero sign language but communicated with them by writing out everything on paper. We quickly came to know and understand each other over the next few days, and I now have such huge respect for both of these ladies and cannot wait to come back and visit. I spent way too many Tanzanian shillings on these designs, but so far it was the best money I have spent in Africa. 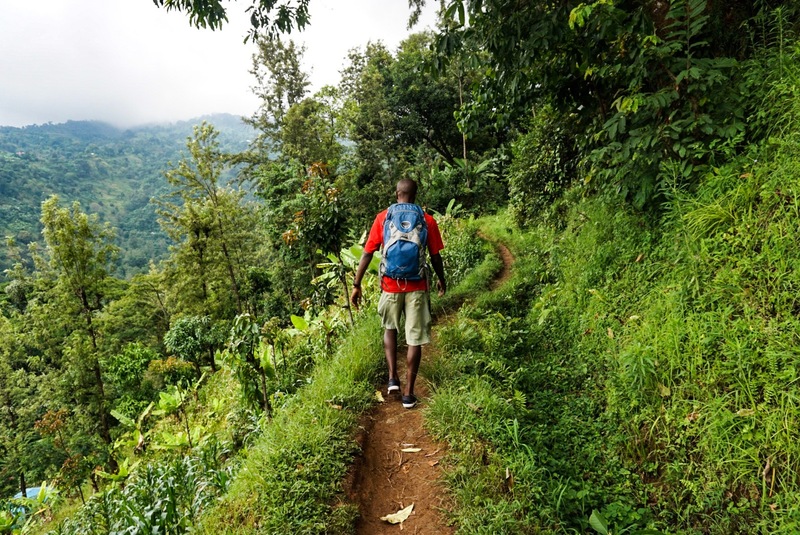 Between designing, stuffing my face with food, waiting for Kilimanjaro to appear out of the clouds, and working away on my laptop, I decided to take a day to hike through a local village in the foothills of Kilimanjaro to explore Materuni. I have not been in the outdoors in over six weeks, and my emotions and mood have been negatively affecting me every day. I truly believe in the healing power of nature. George, my guide, in full flight, chasing Materuni through the jungle of Tanzania. Kristen Fuller. Cocaya made a few phone calls and connected me with a local guide named George (everyone knows everyone in Moshi) who met me bright and early at Shirikisha. I have hiked with many local guides before, so I was not surprised to find out he was a Kilimanjaro guide (they are a dime a dozen here). He told me he quit his high-paying mountain guide job to pursue a career in long-distance running. “Okay George, now I am all ears!" I said. Long story short, he is a professional marathon runner and cyclist who is running the Mount Kilimanjaro marathon this March. His father was a Tanzanian national champion in the 100 meters, so running is in his blood. We continued to ask each other a million questions, and within 10 minutes into our dala dala ride I discovered that he knew my Kilimanjaro guide from 12 years ago, Tosha. Tosha is one of the most magical human beings I have ever met. I mean, what guy would hold my hand at 17,000 feet while I vomited out of my mouth and bottom and cried all at the same time? My Kilimanjaro summit was the most ridiculous thing I have ever done, and I would not have accomplished this peak without Tosha. George and I also had a couple of other mutual friends in common, so it was nice to immediately share common ground, especially since I was going to be spending all day hiking with this guy. After a 30-minute walk into town and a 45-minute dala dala ride up a dirt road, we arrived at a local village high above Moshi town. We paid our village entrance fees and made our way to the trail. When I hike in other corners of the world, I always notice people describe the length of the hike by the number of minutes it takes to reach the final destination. It was 45 minutes to Materuni. At what pace? I usually hike about 0.8 kilometers/hour, so this hike is less than one kilometer? Even on Kilimanjaro, the guides brief you on how many minutes you will walk per day. I probably spent most of my energy converting minutes, miles, and kilometers to figure the distance for each day on Kili, and this day in Moshi was no different. The trail was incredibly muddy and super slippery, and after falling into a ditch a few weeks ago in Mwanza all I could picture was myself falling, ankle deep in mud and sliding down the trail with my expensive camera in hand. A sweet dog walked alongside me for the majority of the hike; apparently he makes this journey multiple times a day hoping for food, and I pretended it was Moo in spirit. I miss my pup, Moo, so much. Materuni in all of its glorious, 100-meter splendor. Kristen Fuller. We hiked through lush green forests and passed local villagers carrying fruits and vegetables from their shambas (farms) to the market. I am always surprised how women here can walk on muddy dirt paths in flip flops while balancing heavy loads on their heads. Here I am, in an overly expensive pair of Lowa hiking boots praying I don’t slip and fall to my death. 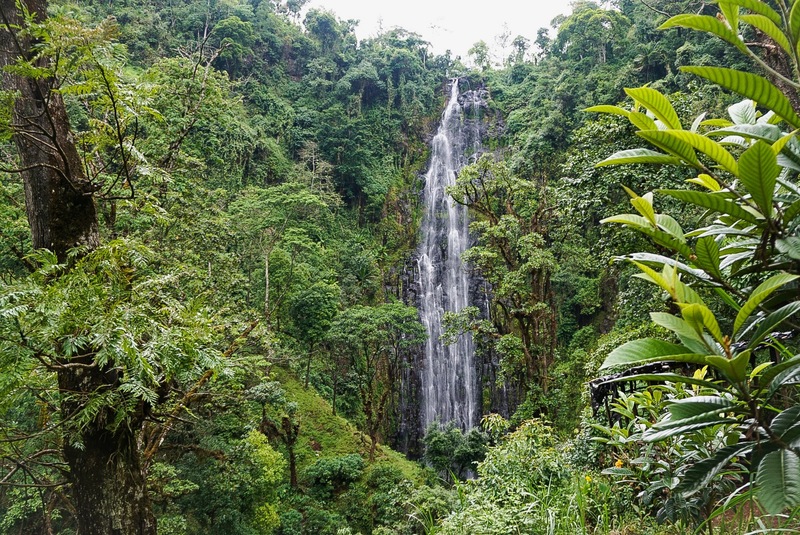 After nearly 2.5 kilometers of muddy, slippery trails, we made it to our final destination: a beautiful 100-meter waterfall that resembled a cluster of tiny individual waterfalls. There were only a few other tourists at the falls, so George and I took a few pictures and spent some time soaking in the beauty before we made our way back to the village. I felt rejuvenated, at peace, extremely sweaty, and so happy to have spent the entire day outside in nature with another amazing human being. In two weeks, I will be hiking Mount Meru, which is the fifth highest mountain in Africa, a trek I have been planning to do for many years. I am looking forward to spending three days on the mountain, and I am sure I will have lots of stories to share.